Grassland birds are disappearing in the northeastern U.S. This decline is largely due to hayfield mowing during the weeks that birds like Bobolinks are actively nesting. New England's working farmers, in particular, face financial pressures that force them to mow earlier and more frequently. To protect these grassland birds we must develop new strategies for promoting conservation on private farms. The Bobolink Project uses donated funds to provide financial assistance to participating farmers who modify their mowing schedules so that grassland nesting birds can successfully raise their young. The Bobolink Project is a proven approach that can protect birds and farms. As a conservation donor, you can help by giving money that allows us to "buy time" for nesting grassland birds. As a landowner, you can help by offering to enroll some, or all, of your hay fields in The Bobolink Project, and be paid to cover some (or possibly all) of the costs you face by delaying your harvesting schedule. If you do not wish to apply to The Bobolink Project, but still want to manage your grassland for birds, see Mass Audubon's Best Management Practices for Grassland Birds guide. The Bobolink Project is a proven approach that can protect birds and farms. This innovative work provides a new way to connect people who are willing to make financial donations to sustain our wildlife and rural heritage with farmers who are willing to help, but who also face stark economic realities. We offer farmers economic assistance to delay their mowing schedules so that grassland nesting birds can complete their breeding cycles. As a conservation donor, you can help by giving money that will allow us to “buy time” so grassland birds can successfully raise young on working farms. As a landowner you can help by offering to enroll your farm in The Bobolink Project and be paid to cover the costs you face due to delaying your harvesting schedule. 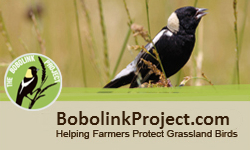 The Bobolink Project truly provides a win-win situation for both farmers and grassland birds. "Birders and farmers share a common interest in land preservation that is often overlooked. A pledge to the Bobolink Project will help by compensating farmers who agree to adopt bird-friendly farming practices. This allows you to support bird conservation AND local farms, which is good for everyone." The application process for the 2019 Bobolink Project is now closed. The number of farms we are able to include is entirely dependent on your donations. It's that simple: the more donations we receive, the more acres we can protect and the more grassland birds we can save. In 2018 we supported bird-friendly agriculture on New England farms totaling about 962 acres. However, we had more interested farmers than we were able to compensate with the available donation pool, and in 2018 we sadly had to turn away bids that would have protected an additional 492 acres. Help us help them in 2019. In recent years The Bobolink Project has been able to protect increasing amounts of acres. The small dip seen between 2015 and 2016 is likely due to the transition of The Bobolink Project to its new administrative structure.